If you are looking for some extra activities have a look at some of our suggestions. Tried and tested! Kids Proof Arnhem – here you can find more than 140 possibilities for all different kinds of sports and classes, offered in Arnhem and surroundings. On the webpage you have a filter based on kids age. Very handy. 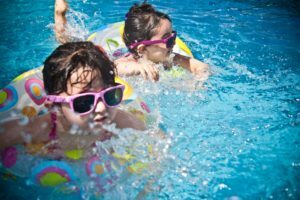 Sunday is family day at the swimming pool “Grote Koppel” en “Valkenhuizen” https://www.zwemmeninarnhem.nl They also have baby swimming classes Monday – Friday. The choice of music classes is quite rich, here we have listed some of our favourites. Do check online for classes in your area too. KinderCrea offers art sensory and creativity workshops for babies and toddlers, in English. They use indoor and outdoor spaces to inspire and encourage children to pursue their own ideas. Survival Arnhem has access to a beautifully located training area of 5000 m², with private parking, at the Rijkerswoerdse Plassen between Arnhem and Elst (gld). On the site there is an approximately 320 m long circuit with various combination and rope obstacles. you can be kayaked and the archery range is regularly included in the training. After the training you can relax on the terrace or in the log cabin by the wood stove. For adults and children from an age of 9 years.